King Machine is what I can intricately describe as a 3D platforming puzzle sandbox game, but also a convoluted and unpolished crossover of multiple genres. The game has no meat because it lacks both direction and delivery. Take a look at gameplay videos and the Steam page description. You’ll find it appears to present something fresh and original. The problem is, it doesn’t cater to the casual player. A couple minutes into the game and you’ll feel lost, confused, and disinterested. An interesting concept and story to go along with it, the player controls a robot that has been activated amongst the rubble of an abandoned factory. The main objective is to traverse different levels and restore both power and function to the factory by creating machines with the parts provided. There are several solutions to any puzzle; and you control all aspects of how to approach each situation and build your own unique contraption. It’s a free form style, and sadly, it hurts the game. The gameplay puts an excessive emphasis on the player’s creativity and leaves too much up to the player. It feels like it was designed for a developer or someone who is very familiar with the mechanics, and not for the Steam player-base who has no prior or in-depth knowledge of how the game works. One of my main gripes is the lack of guidance. 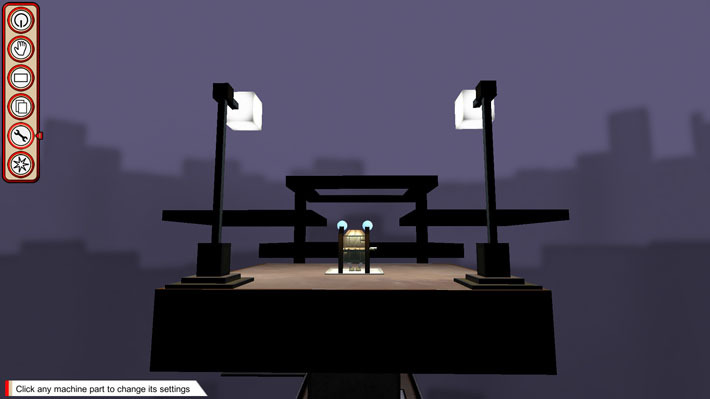 The game includes tool-tips, a manual accessed through the menus, and interactive tutorial events, but they seem clumsily put together and offer no clear direction for the player. Throughout the different levels, there is never a clear and concise idea of what it is you should be doing. The game does a decent job of teaching you the controls, but it doesn’t matter unless you know your actual objective. What it really offers is a big interactive sandbox environment with the potential to make cool contraptions, but no incentive or elaborate instruction to do so. It also doesn’t help that the controls feel clunky and unintuitive. Yes, it teaches you how to manipulate the environment, but that doesn’t mean it works well. Most of my time in-game was spent struggling to properly rotate and place objects. If a general player can’t even utilize the simple tools of your game, how can you expect them to comfortably interact with the main content? Having experienced the awkward controls paired with the lack of instruction, I found myself aimlessly placing blocks to build myself pathways to level exits. These, in turn, carried me to the next level to interact with randomly assorted objects, given functions and purposes I had no knowledge of. Let’s just say, the amusement was minimal while the frustration was at its highest. King Machine had a new and interesting idea, but it failed to execute it properly. 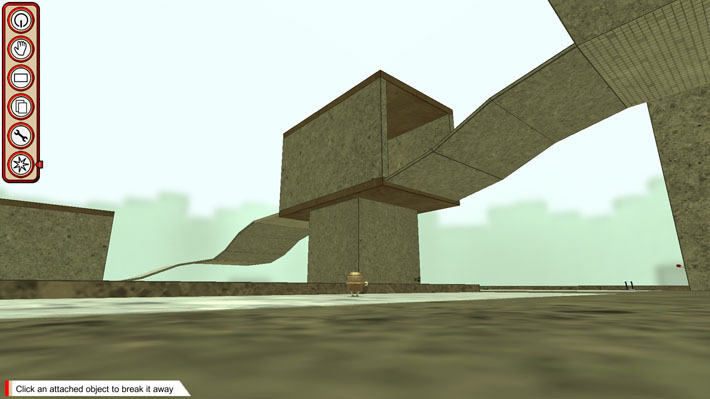 The developers attempted to create a title that would innovate upon multiple styles of games, but did not make it intuitive to its users. From what I experienced, there are many tools and objects to play around with, along with several boss battles. The game definitely has a solid foundation and much potential; it just needs to be polished. It needs a better system to ease the learning curve for new players. I still give King Machine kudos for attempting to be something different; the industry progresses when people are creating rather than copying.